Amidst the intensity of paperwork I managed to escape to France for a few days for yet another meaty jaunt. I always think that if people invite you to something that you can turn them down once, but if you do it twice, you’ve probably lost that opportunity forever. So when Kate Hill invited me on a Charcuterie Road Trip last year (which I couldn’t attend) I was worried that I might not get another chance. When the second invite came, my bags were pretty much packed instantly. I’d met Kate Hill at the School of Artisan Food a while back when she hosted the Charcuter-ish event. 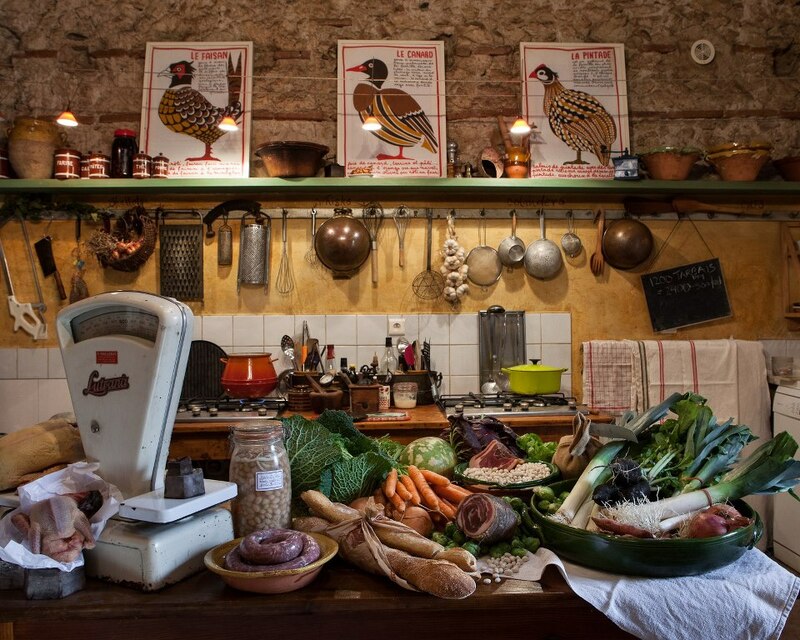 She runs a culinary retreat in Gascony called Camont. It’s a stunning traditional limestone towered farmhouse set in a hectare of land along the side of the Garonne canal. Viewers of the Rick Stein ‘French Odyssey’ program will be more than familiar with her as she featured in the series and her kitchen provided a welcome home for Rick to cook in on more than one occasion. Kate’s kitchen, and yes, it does look like this. Kate’s courses are renowned, and many of the people I met on my travels across North America had learnt their craft while passing through her kitchen. 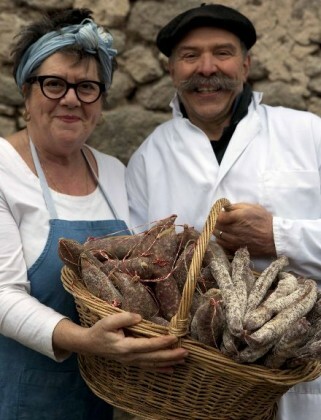 I’d heard near legendary stories about the Chapolards, a local farming family who provide whole supplychain pork and pork products – “from seed to sausage”. Although in modern farming terms they’re a relatively small farm the Chapolard brothers manage to support their families by growing their own crops (using co-op owned machinery), rearing their own animals (XL cochon! ), slaughtering them at a co-op owned abattoir (which they part own), processing on-farm and then selling all their products directly to the public. Put simply, they’re an inspiration. My favourite producer of the trip was Eric Ospital, he runs his family business Louis Ospital and in addition to own labelled products produces a speciality ham under the iBaiona label. These hams are sourced from animals from three family farms, fed a specific non-GM diet, reared to 180kg at a minimum of 11months. The hams are salted, equalised and put through a series of drying stages and aged for between 15 and 20 months. The production method differed slightly from the Italian methods that I’d seen. Drying temperatures were different, and the application of panne or pannage (the equivalent of Italian sugna) was very different and resulted in quite a different product. We were very fortunate to get to see Eric’s ‘ham house’ his ‘theatre of hams’ where they mature the last few months. It’s here that he entertains the cream of Michelin starred Chefs, diplomats, celebrities and those looking to invest in ‘ham futures’. Eric was sent by his father at a young age to work in Paris – his contemporaries from that time are now his customers. Eric’s parting words to me were ones of good luck for the 6 Nations decider between Wales and England, I have an inkling that it went some way towards the victory. Sticking with the ham theme, we visited a stunning co-operative drying house. Similar to ham facilities in Italy that I’d seen they used much the same equipment to massage and salt the hams before leaving them to cure, equalise, ferment and dry. I started my business from a family history of ham production (which are essentially barn hams). 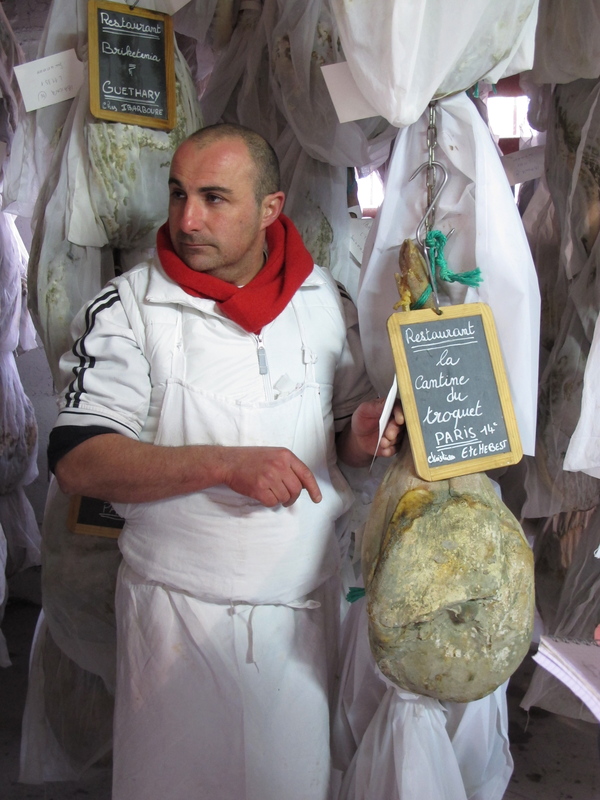 The mode of production in Italy and France don’t differ all that much, it’s just that they mimmic what we used to do on a small scale seasonally so that the hams can be produced year-round. However, there is much more science to it than that, and these hams have a refinement that’s lacking in home-produced barn hams. I know of plenty of people who produce an occasional home-prosciutto, it’s a relatively simple process, but there’s no refinement or consistency to that product, it’s wholly down to natural environment – whether it’s the quality of the meat, the animals diet, the kill weight, fat composition or environmental effects such as humidity, temperature and natural moulds. The real skill is to understand how these hams are influenced by those differing elements and to choose a mode of production that produces the type of ham that you want to make. The other obvious realisation when you see a facility producing hams is that it’s a big operation. During my Italian trip last year to a machinery supplier I asked for basic costings for a ham system. €1m for an entry level facility, which puts ham production for me in the fairytail/aspiration business category. There are UK companies producing whole air dried hams but these are cottage businesses who often derive the mainstay of their turnover from other products. If you trawl the internet for modes of producing air dried hams it’s easy to find guidance on drying in single temperature and humidity chambers – it’s a mode of production, but to be truthful you’ll get a pretty bland and basic product if you do. You really need these more complicated systems that derive seasonality in the drying conditions both from temperature, humidity and also crucially airflow. I’m sorry if I’m going ‘off on one’ on the subject of ham, but having travelled extensively now and tasted so many different products, you start to realise the complexity of flavours that can be produced based on regional variation. It’s not just the balance of salt and pork and whether it’s a punchy salty ham, or a meaty taste or something with delicate notes, but there’s subtitles in the inclusion of aromatics in the cure mixture, whether there’s pepper in the lard mixture that’s rubbed on, the nuttiness through the natural occurring moulds and even the effect of temperature on the fats. Creating the perfect ham will be a life long project for me. I’ve set myself a timeline of 10 yrs to get going. But considering it’s taken me two years to get to the point that I’m at now, that may be a foolhardy figure. After all, I don’t even have a decent sized facility yet for the production of all the other bits of lovely charcuterie that I want to produce. A case of cart before the horse? Perhaps, but everyone needs a dream. After visiting the ham house we headed to Pierre Orteiza, one of the five producers who owned the drying house. We were met by his extremely welcoming wife and had a stunning lunch in their restaurant/shop/processing space. Pierre was one of the leading producers instrumental in protecting the future of the local Basque pig. It’s an Iberian type pig, very different from the more developed ‘Celtic’ pigs that we have here in the UK and that are used for Italian commercial production. At one time the breed was down to 30 sows and 5 boars, but they’ve managed to turn the tide and have 200 breeding sows now and produce in excess of 2000 meat animals per year. In keeping with other Iberian pigs (such as the famed acorn fed Spanish and Portugese varieties) they’re undeveloped, slow growing animals, they have flatter hams, larger hooves, a slight saddleback and have a higher level of fat covering. Much the same as the Mangalitsa that we’ve reared they have a chemical composition to their fats that lends itself to longer ageing times than ‘Celtic’ breed pigs. Rearing systems differ greatly to more commercial production, animals farrow indoors or out, wean at 6-8weeks and are moved into groups of around 30-40 animals in individual ‘parks’ of hillside grass and woodland at 3 months. They’re moved every 3 months to new parks and the previous park is allowed to rest. Animals spend a minimum 12 months outdoors and are slaughtered between 15-18 months at high weights of 160kg. Traditionally pigs would have been finished seasonally in small groups outdoors in woodland feeding largely on chestnuts but the nature of continual modern production doesn’t allow for this. Looking at modes of rearing abroad has really made me question our methods here in the UK. 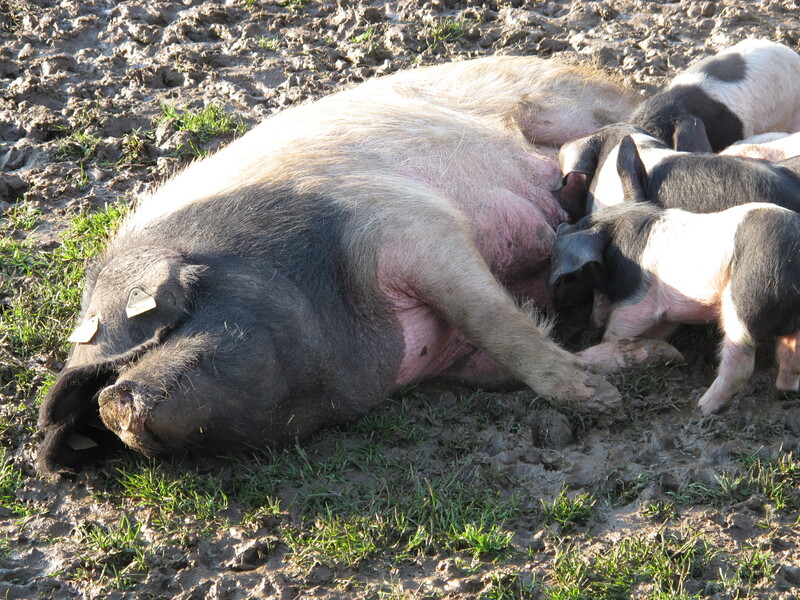 Whether it be a smallholder producing rare breed pork or an intensively reared producer rearing commodity pork, often composite feeds for both are identical, and animals invariably are reared to pork weight at around 60kg at a maximum age of 6-7 months. The ethos on the continent is much the same as what my grandfather would have done pre-war and pre-intensification (and what we still do) as we rear animals to 100kg for pork and 150kg for charcuterie. Pig breeders in the UK are always shocked when I mention these weights, I’ve yet to come across other producers who still rear to these traditional standards unless their old farming families raising two or three pigs for a seasonal kill. Modern pork weights of 60kg may produce fast pork, but it doesn’t provide flavour, well, not flavour like an 18month old animal where the meat is rich, dark red and developed. There’s a whole blog post to come on this subject I expect as I’ve already drafted a ‘pork credo’ for myself. 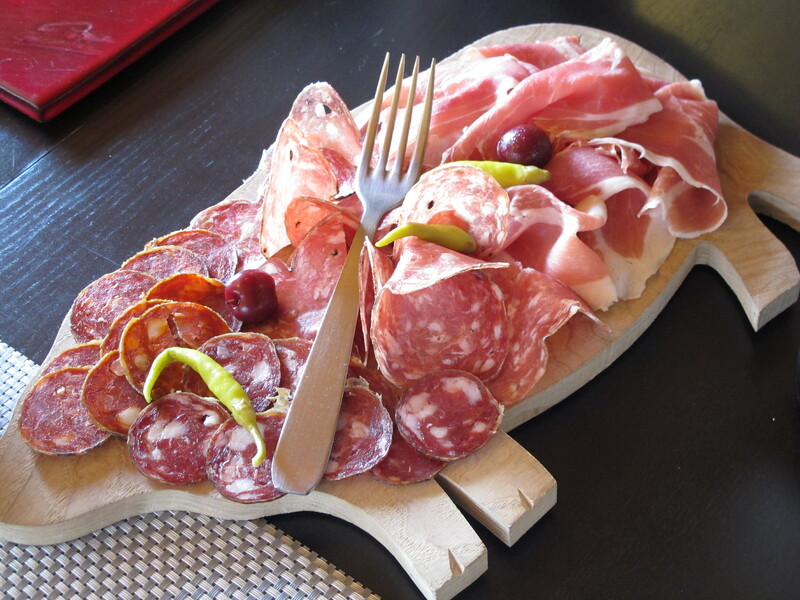 So, there’s a taste of my trip to France, and some ranting thrown in for good measure. Our grant application is drawing to a close so I expect I’ll have some more time to contribute to the blog and some other neglected aspects of the business from now on. Don’t neglect the quality of ‘terroir’ when comparing hams from different regions. Do you mean the actual effect of the land or the more romantic ideal of terroir? I fully believe that a century ago when we were killing animals seasonally and in smaller numbers that land had a major effect on the animal. I can honestly say that the animals we rear for meat for our own consumption that have foraged in woodland through autumn and are slaughtered in winter have a vastly different flavour to our more commercially reared animals which are killed year round. But 3 pigs in 7 acres, killed seasonaly doesn’t provide a sustainable business model. One of the producers we met in France actually brought this up – he said farm/holding sizes hadn’t changed in the last century, but the intensification of farming had. Where 40 animals would be grazing in woodland in any three month period now, in the past that same land would have been home to only two animals for the whole year. The natural woodland forage, specifically chestnuts in that region would have undoubtedly affected the quality of that pork at that time. I’m sure the outdoor rearing does still have an effect, even if it’s just from a higher levels of vitamin E consumed but in the whole scheme of things considerably less so. Bravo on your dream to create the perfect ham. As you say everyone needs a dream. Doesn’t matter whether it takes 10 months, 10 years or even 10 lifetimes. It’s all about “occupations available”(to quote from A Beautiful Mind) and becoming utterly absorbed in those occupations.